Sonusman provides a multitude of premium audio services: live sound system rentals, production and stage management, studio recording production, acoustical consultation, and instrument tech/repair. These are just the highlights of how they can service your music support needs... and they needed the logo to reflect such a level of professionalism. 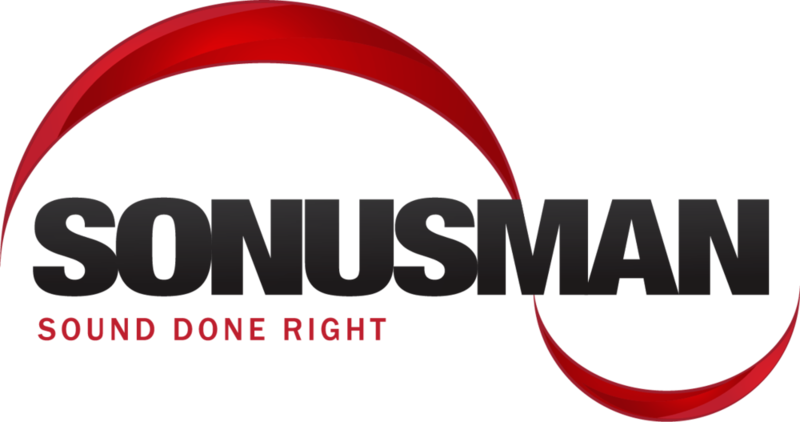 The original, solid but a little dated, Sonusman Logo. Sometimes a logo or branding doesn't need a complete overhaul and redesign. Sometimes just a few little tweaks are all that's needed to take a good logo to the next level and have an enormous effect on the overall design. Sonusman is a great example. He already had a pretty sweet looking logo, we just tweaked it a bit and brought it into the current decade. 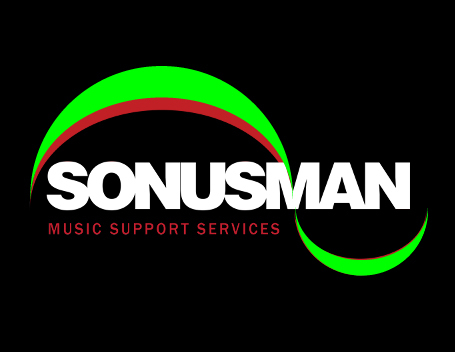 We also provided him the crucially valuable source files of the logo redesign allowing the Sonusman, Ed Rei owner and Chief Sound Engineer, to properly use his fresh new branding. 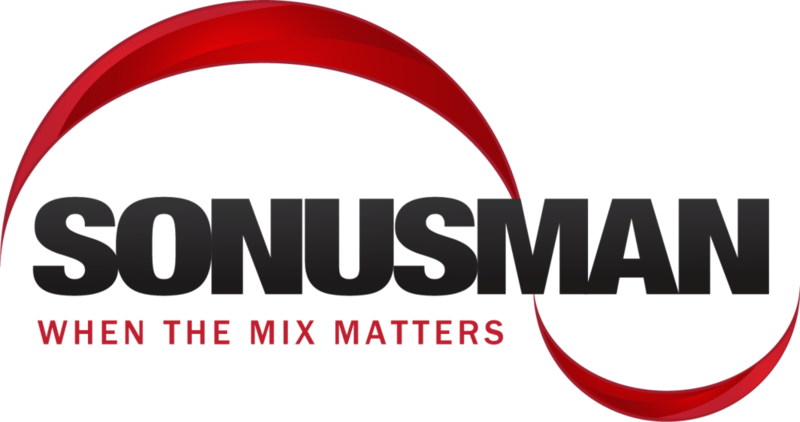 The old Sonusman logo featured a classic Helvetica typeface. By using Helvetica Neue, which is from the same font family, like a cousin, just newer, we were able to make the overall branding slightly taller. This allowed for the brand name to appear just a hair bigger without being wider or longer. It's almost never a good idea to use 100% pure white or black if you can avoid it. In some cases it can actually be a little harsh on the viewer's eyes or appear un-polished. To alleviate this we went from a super dark 95% grey to 100% black in a gradient on the black text logos and pure white to subtle grey on the white text version. Very hard to notice, but it makes the overall image more pleasing. We did the same thing to the "swooshes" by adding some nice dynamic curves. This broke them up a little and lends them some depth and interest. These were further accentuated, again no solid colors here, with very slight gradients. Click on any image to see it in a larger and higher definition view. Here the brand name of the logo is in 100% black. And here is the same logo redesign with the branding in a very slight super dark grey to black gradient. Here the same principle is applied to the white lettering. This example has the logo branding in 100% white. Here the Sonusman goes from 100% white to a slight grey in a very subtle gradient. If you'd like to leave a comment and let us know if you agree, that slight gradients look better than 100% whites or blacks, please feel free to do so in the comment section below! We also moved things around a tad so that the top red swoosh wasn't peeking out behind the M in Sonusman. Again, tiny changes make big differences. You can see just a hint of red "swoosh" showing behind the "M" of the original logo. We moved things around in the redesign to eliminate this. Here you can see the curvature of the new swooshes, in green for easy viewing, overtop the old swooshes in red. We included a wide variety of tag lines for Sonusman for different uses. All different slogans and variations inluded a black text for light backgrounds and white text for dark backgrounds version. Finally, we delivered to the Sonusman all of the possible file types, sizes, and variations he made need depending upon purpose. A branding package totalling 305 files! Files for screen printing, business cards, merchandize, large banners, etc. in the form of: editable PDFs of each variation, JPGs with and without backgrounds in a wide range of size, PNG files with transparent backgrounds in a large range of sizes, as well as an Adobe Illustrator Master File. To learn how to optimize your photos for web use in Windows Paint click here. To learn how to optimize your photos for web use in Apple Preview click here.